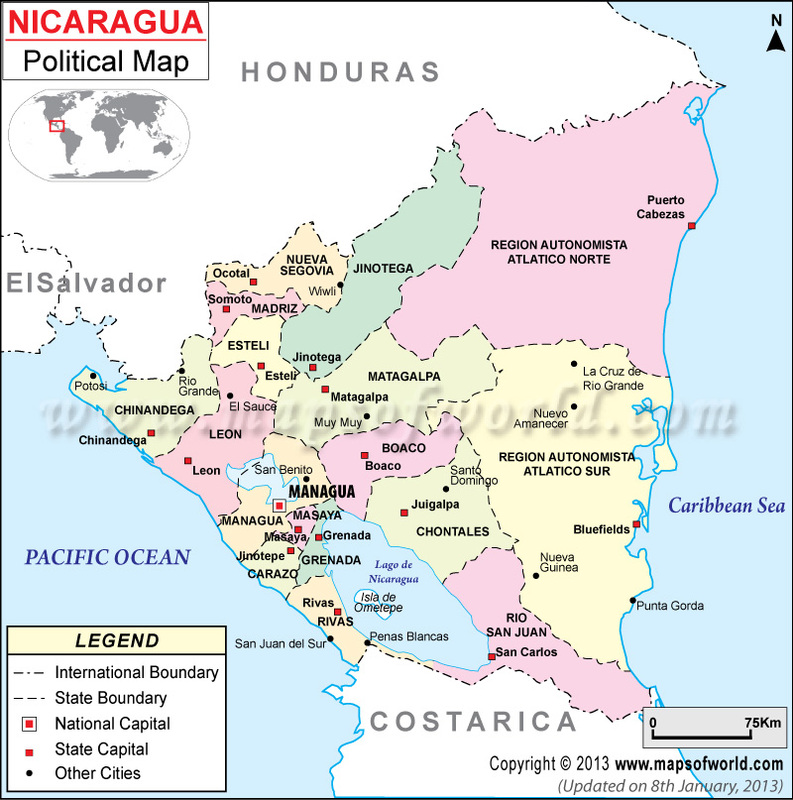 Explore map of Nicaragua, Officially known as the Republic of Nicaragua, it is the largest country in the Central American isthmus, bordered by Honduras to the north and Costa Rica to the south. Nicaragua's physical geography divides it into three major zones: Pacific lowlands; wet, cooler central highlands; and the Caribbean lowlands. The official flag of Nicaragua was adopted on August 27, 1971. The Nicaraguan Flag consists of a horizontal bicolor triband of blue and white, with the national coat of arms centered on the middle band. The first evidence of human inhabitants in Nicaragua is a set of footprints embedded on volcanic mud in Managua. The footsteps are that of a family who traveled the area some 6000 years ago. There isn't much known about the country's prehistory, but when the first European explorers found Nicaragua in the 15th century, it was inhabited by several indigenous groups. These inhabitants were related to the Mesoamerican civilizations, specifically to that of the Aztec and Mayan civilizations. The first European to arrive in Nicaragua was Christopher Columbus in 1502. However, it was only in 1520 when the first attempt to conquer the country occurred, by Gil Gonzalez Davila. The first settlement permanently established was in 1524, through the efforts of Conquistador Francisco Hernandez de Cordoba. The settlements became the first 2 principal towns of the country. Throughout the years, the country was under the rule of Spain. The country achieved independence through the triumph of the Mexican War in 1821. On September 15, 1821, Nicaragua became independent of Spain but became a part of the first Mexican Empire. After the Mexican monarchy was overthrown in 1823, the country became part of the United Provinces of Central America, which also marks their full independence from any state or nation, and declaring the new country of The Republic of Nicaragua. 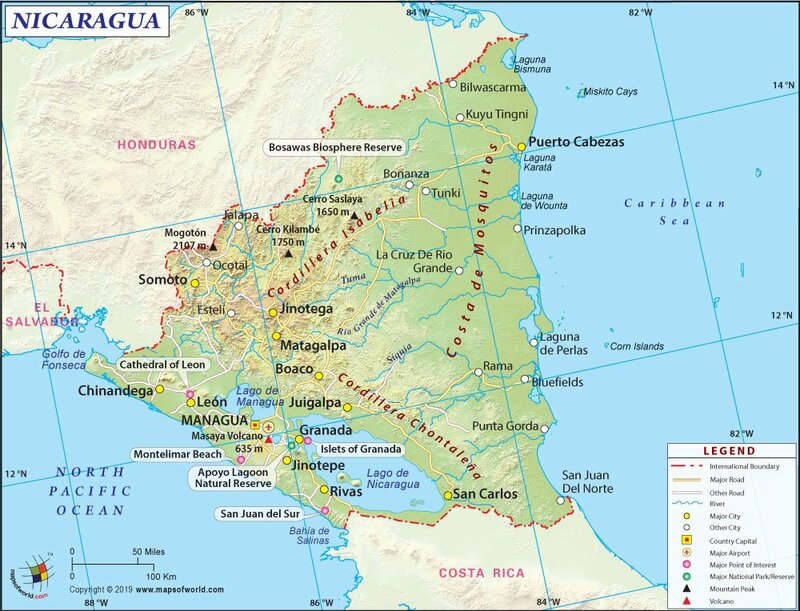 Nicaragua is located in Central America, with the Pacific Ocean located to its west, and the Caribbean to the east. Honduras is found to the north, and Costa Rica to the south. The country can be divided into 3 regions: the Pacific lowlands, the Caribbean lowlands, and the central highlands. About a fifth of the land is made of protected areas like national parks and nature reserves. Its close proximity to the equator endows it with plenty of natural resources, which have been exploited throughout its history. Nicaragua is a democratic republic, governed by a presidential representative elected through national elections. The president becomes the head of state and head of government. Executive power is practiced by the government, while legislative is governed by the government and the National Assembly. The Judiciary is separate and independent of all branches of the government. Tourism is Nicaragua's 2nd largest industry, only next to the agricultural sector. With almost a thousand kilometers of coastline, Nicaragua is famous for its beaches and resorts. Among the most popular places to visit are the Bluefields, the Granada Islets, the Selva Negra Mt. Resort, and the Corn Islands. Bluefields is found on the Atlantic coast and is one of the major tourist destinations in the country. The oldest city on the coast, it hosts an annual festival that lasts an entire month, called the Palo de Mayo. Occurring every Spring, this carnival-type festival is a celebration of the English and Creole customs of the people in the city. The Granada Islets are a group of over 300 small islands located in Lake Nicaragua, which is found southeast of the city of Granada. Some of the islands are privately owned, with homes and guesthouses, as well as hotels and places for tourists. Boating between the islands are a popular tourist activity. The Selva Negra Mountain Resort is considered to be Nicaragua's most famous hotel. Built by German immigrants in 1891, their private home and coffee estate opened to the public in 1976 and has since become a popular tourist resort. The Corn Islands are found east of the Caribbean coast of Nicaragua. It's made of 2 big islands, divided into 12 municipalities. The islands are pretty small and no motor vehicles are allowed. The best way to get around the islands is by foot. The waters are popular sites for scuba diving and snorkeling. Elementary education in the country is free and compulsory but children are not aggressively required to go to school, as many families in rural areas need them to do work. The school year starts in February and ends in November. Higher education is mostly found in the city of Managua. There are 48 universities all around the country, with 113 colleges and technical schools. The oldest university was built in 1812 under the Spanish era, which is the Universidad Nacional Autonoma de Nicaragua. Baseball is the country's most popular sport, with a strong tradition of American-style baseball. The country had an American president in 1856. William Walker declared himself president of the country with the purpose of turning it into a slave state of the United States. He was driven out of the country the next year.